Summary: Gulf World Marine Institute, Inc. staff responds to live stranded sea turtles along the coast of the Gulf of Mexico in Florida Panhandle. GWMI will purchase a vehicle to rescue and transport sea turtles that are stranded along the Florida coast line and brought into rehabilitation. In 2010, GWMI responded to over 1800 stranded/cold stunned sea turtles. A suitable vehicle is critically needed to facilitate field response for rescues and mortality retrievals. GWMI operations that benefit both State and Federal sea turtle program goals will be enhanced. 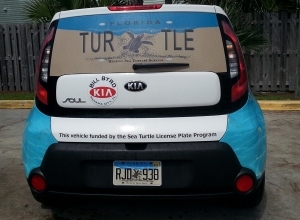 Results: Since vehicle was purchased, GWMI has gone on 12 sea turlte rescues and releases, has been used on 15 outreach presentations, and it has been on display at local events to help promote the Sea Turtle License Plate Program.